After coming back from SST in China last spring, Yadira Figueroa, an elementary education major, decided that she needed to pursue her real passion — art — even if that meant changing her major senior year. Figueroa’s interest in art began early in high school. She began with drawing and eventually experimented with other mediums such as oil painting. Though she was drawn to the idea of a career in art, the pressure to pursue a more “academic” career delayed her decision. 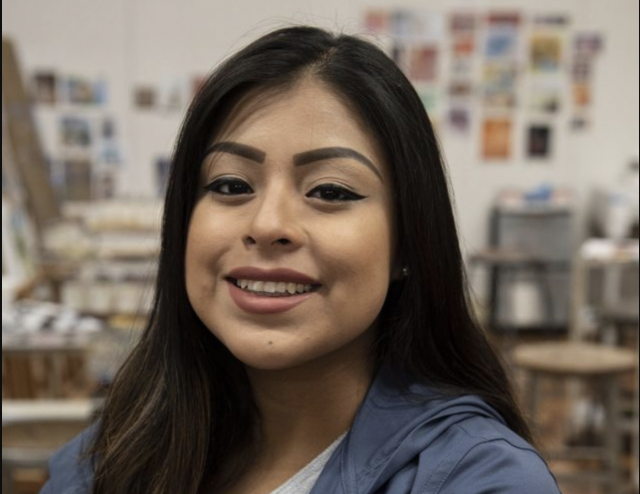 As she entered the busy world of college life, Figueroa thought she would have to leave the craft behind to focus solely on school. However, after some strategic maneuvering, she was able to fit in some drawing classes which led to her rediscovering her love of creating and eventually finding her vocation. Though she still worries about the risks of following a non-traditional career, Figueroa is excited about what the future might bring. After her graduation next spring, Figueroa hopes to move to a larger city. She is open to beginning her career wherever she can find work. Figueroa is drawn to the idea of taking a role in a creative marketing team at some point in her future. She also loves the idea of starting her own business one day, though probably not until after her career is sufficiently established. Over the next couple months, Figueroa will be preparing pieces for her senior art exhibit in the spring. Though she has been creating on and off for years, this will be the “first time in a long time [for me] to really focus on art…on a whole show,” she said, and added that she is “excited to share [her work]”. Figueroa describes her work as being heavily influenced by nature, floral patterns and the human figure. Her preferred mediums are oil painting and paper and pencil. Much of her work also features modern invert technique, in which colors and other art elements are used in the opposite order, position or direction than they would normally be. Though Figueroa is most comfortable with the mediums she knows, she is stepping out of her comfort zone for the upcoming senior exhibit. She plans to translate her practice with paper and pencil into graphics and design for her exhibit. Though her journey has been a little unconventional, Figueroa wants to remind everyone that when it comes to deciding what you will do for the rest of your life, be sure to “go with your gut.” It’s always better late than never.